When the specific antibodies (agglutinins) bind to surface antigens of bacteria/virus or any antigens immobilized in particulate matter (such as latex particle) and cause the formation of a visible clumps, such test is called agglutination test. Identification of serum antibodies with known antigens. Epidemiologic purpose (Public health laboratories): Antisera against flagellar H antigen and capsular Vi antigen of salmonella. Size of the carrier enhances the visibility of agglutination. Passive hemagglutination: Ag that are being bound by Ab are not the Ag of RBC but are passively bound Ag. Latex beads coated with specific antibody are agglutinated in the presence of homologous antigen (bacteria). N. meningitidis: rapid detection of meningococcal capsular polysaccharides in CSF. 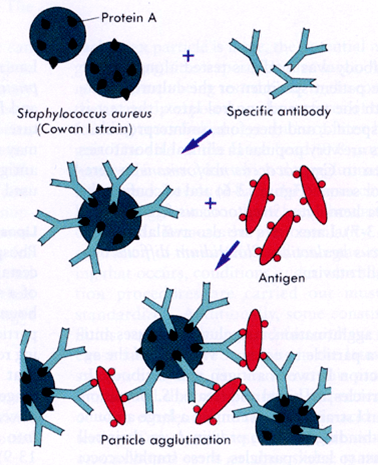 Specific antibody is bound to the surface protein A of staphylococci (Cowan type 1 strain of Staphylococcus aureus). 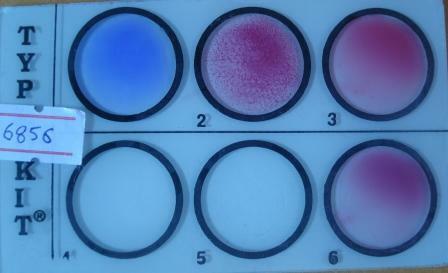 Soluble microbial antigen in the specimen is mixed with the COAG reagent, resulting in the agglutination of the staphylococcal cells. where can i get tryptic soya broth? where can i get tryptic soy broth powder?